Dennis Reid has spent a large portion of his life fishing for salmon on the West Coast and has had phenomenal success hooking the prized fish. With degrees in biology, philosophy and public administration, and a burgeoning literary career in poetry and fiction, Dennis seems to be particularly suited to the mental and physical battle that is salmon fishing. 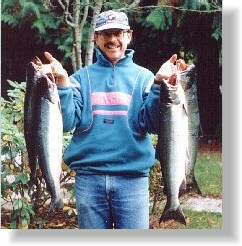 Dennis makes his home in Victoria, British Columbia, and is very active in the local fishing and literary communities.